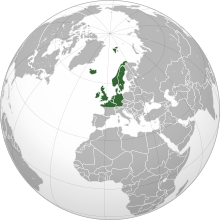 Geographically, Northwestern Europe usually consists of Ireland, the United Kingdom, Belgium, the Netherlands, Northern Germany, Luxembourg, Northern France, Denmark, Norway, Sweden and Iceland. Finland, Southern Germany, and Switzerland are also often considered part of the grouping. Austria is also sometimes defined as Northwestern Europe, though less frequently. Southern France is not regarded as northwestern, and it is usually geographically and culturally considered part of the Mediterranean region or Southern Europe. Due to its geographically eastern position and unique status as a Finnic language country, Finland is sometimes geographically and culturally excluded from Northwestern Europe. Similarly, the Baltic countries of Estonia, Latvia and Lithuania, although considered part of Northern Europe, are excluded due to their geographically eastern positions and connections to the rest of Eastern Europe. The term is helpful when discussing issues of climate or biology. Germanic languages are widely spoken in most of Northwestern Europe, although other languages are also present, including Romance languages in Northern France, Wallonia and Luxembourg, and Celtic languages along the western fringes of the British Isles and in Brittany. The region also has a history of Protestantism (Lutheranism, Calvinism and Anglicanism) that differentiates it from its Mediterranean / Southern European / Latin and Eastern European / Slavic neighbors. The definition of Northwestern Europe as correlating with Protestant Germanic Europe leads to somewhat the same definition as the geographical one above, but would tend to exclude northern France, Wallonia, Southern Netherlands, Catholic Belgium, southern Germany, Austria, and Ireland. This is because France and Wallonia, despite their historical Huguenot populations, are considered Catholic Romance language countries, while Belgium, Southern Germany, Austria and Ireland, though largely containing Germanic language speakers, are historically Catholic. Measured by the attribute of Protestantism and Germanic culture, Northwestern Europe would therefore be equivalent to the area known as Northern Europe combined with the Low Countries, much of Switzerland and Northern Germany, and minus the Baltic regions, Belgium and Ireland. A definition of Northwestern Europe as an inclusive term for those European countries not falling within Southern Europe or Eastern Europe was used by some late 19th to mid 20th century anthropologists and eugenicists, who used Northwestern Europe as a shorthand term for the region of Europe in which members of the Nordic race were concentrated, in contrast to the Eastern and Southern regions of Europe that contained Mediterranean peoples, Slavs, and other non-Nordic peoples. Under this racialist view, all of the Germanic countries and areas such as northern France, which historically contains large numbers of people of Celtic and Germanic Frankish descent, would be included as Northwestern Europe, due in part to the predominance of phenotypically Nordic people within these areas. In military history, especially in Commonwealth countries, the battle honour North-West Europe has been used to refer to the two land campaigns in that approximate area during World War II. Two separate battle honours were awarded to regiments who took part in these campaigns. The North-West Europe Campaign of 1940, during the Battle of France, was restricted to Belgium and the French Channel ports. The North-West Europe Campaign of 1944–1945 started with the landings in Normandy and ended with Field Marshal Montgomery taking the German military surrender of all German forces in the Netherlands, north-west Germany and Denmark on Lüneburg Heath in north-west Germany was fought by the British 21st Army Group. In the First campaign the French Army was responsible for the rest of the Western Front from Luxembourg to Switzerland, as were the American 12th Army and 6th Army Groups during the second campaign. ^ S. K. Barnes, Richard (1994). The Brackish-Water Fauna of Northwestern Europe. Cambridge University. ^ Lachmann, Richard (2000). Capitalists in Spite of Themselves : Elite Conflict and European Transitions in Early Modern Europe. Oxford University Press. Retrieved 15 April 2015. ^ Loveluck, Christopher (2013). Northwest Europe in the Early Middle Ages, c.AD 600–1150. Cambridge University Press. ^ a b Boje, David M. (2015). Organizational Change and Global Standardization: Solutions to Standards and Norms Overwhelming Organizations. Routledge. ^ a b Blinkhorn, Martin (2014). Fascism and the Right in Europe 1919-1945. Routledge. Retrieved 15 April 2015. ^ Lachmann, Richard (2000). Capitalists in Spite of Themselves : Elite Conflict and European Transitions in Early Modern Europe. Oxford University Press. ^ Kono, Shigemi (2008). The Demographic Challenge: A Handbook about Japan. BRILL. Retrieved 18 February 2016. ^ Ward, Deborah E. (2004). The White Welfare State: The Racialization of U.S. Welfare Policy. University of Michigan Press. ^ American Academy of Political and Social Science (1936). The American people: studies in population. American Academy of Political and Social Science. ^ Rutter, Frank Roy (1908). Cereal production of Europe. U.S. Dept. of Agriculture, Bureau of Statistics. ^ Goyan Kittler, Pamela; Sucher, Kathryn (2007). Food and Culture. Cengage Learning. Retrieved 15 April 2015. ^ United States. Congress. House. Committee on the Judiciary (1955). Current antitrust problems: Hearings before Antitrust Subcommittee (Subcommittee No. 5). U.S. Govt Print Off. ^ J. Richard, Carl (2006). The Battle for the American Mind: A Brief History of a Nation's Thought. Rowman & Littlefield. Retrieved 15 April 2015. ^ Berkhof, Hendrikus (2010). Christian Faith. Wm. B. Eerdmans Publishing. ^ a b Ciment, James; Radzilowski, John (2015). American Immigration: An Encyclopedia of Political, Social, and Cultural Change. Routledge. ^ Hayes, Patrick J. (2012). The Making of Modern Immigration: An Encyclopedia of People and Ideas: An Encyclopedia of People and Ideas. ABC-CLIO. ^ Hutton, Christopher (2005). Race and the Third Reich: Linguistics, Racial Anthropology and Genetics in the Dialectic of Volk. Polity. Retrieved 15 April 2015. ^ d'Alroy Jones, Peter (1975). Since Columbus: Poverty and Pluralism in the History of the Americas. Heinemann. Retrieved 15 April 2015. ^ Boettiger, Louis Angelo (1938). Fundamentals of Sociology. Ronald Press. ^ Lynn, Richard (2001). Eugenics: A Reassessment. Greenwood Publishing Group. pp. 35–37. ^ Social Studies for Teachers and Administrators. McKinley Publishing Company. 1946. Retrieved 15 April 2015. ^ Baradat, Leon P. (2015). Political Ideologies. Routledge. ^ "North-West Europe". Canadian Soldiers. Retrieved 9 August 2012. ^ Olalde, Iñigo; Brace, Selina; Allentoft, Morten E.; Armit, Ian; Kristiansen, Kristian; Booth, Thomas; Rohland, Nadin; Mallick, Swapan; Szécsényi-Nagy, Anna; Mittnik, Alissa; Altena, Eveline; Lipson, Mark; Lazaridis, Iosif; Harper, Thomas K.; Patterson, Nick; Broomandkhoshbacht, Nasreen; Diekmann, Yoan; Faltyskova, Zuzana; Fernandes, Daniel; Ferry, Matthew; Harney, Eadaoin; De Knijff, Peter; Michel, Megan; Oppenheimer, Jonas; Stewardson, Kristin; Barclay, Alistair; Alt, Kurt Werner; Liesau, Corina; Ríos, Patricia; et al. (2018). "The Beaker phenomenon and the genomic transformation of northwest Europe". Nature. 555 (7695): 190–196. doi:10.1038/nature25738. PMC 5973796. PMID 29466337.